If you are a beginner programmer as me, you will find early binding is a lot easier to implement compared to late binding. However, you will have compatibility issue if the users of your application is non controllable. 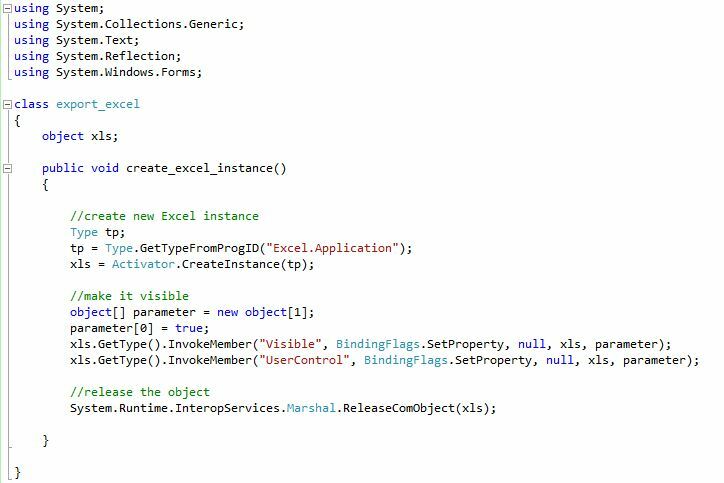 For example, if your code utilize Excel 2007 library, then your application will throw an exception if its being used on Excel 2003. By using late binding, you eliminate this problem (but your code must use only common Excel command). Of course the initialization must be written inside a class. The above command must be executed after all the tasks are completed, which means we’ll put in on the last section of our code. So now the class export excel is ready to use by calling the public member create_excel_instance. Next article will focus on how to make the code nicer.